While large groups like the Wind Symphony have conductors, ensemble players are on their own. They must learn to start together and choose a tempo and stick to it. They are responsible for dynamics, balance, phrasing, and playing the right rhythm, among other skills. Much like a sports team, if everyone doesn’t carry his weight, the outcome won’t be a success. 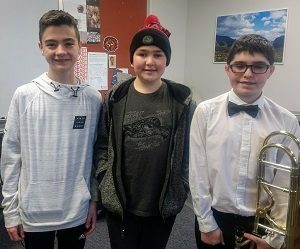 The challenges of small ensemble playing have helped the three students grow in many ways. For instance, Dylan says, “My articulation has gotten a lot better.” Mitchell, on the other hand, notes that his tone has improved over the course of the year. In addition to a master’s degree, Connors holds a Professional Studies Certificate from the Colburn Conservatory in Los Angeles and a Bachelor of Music from Ithaca College. 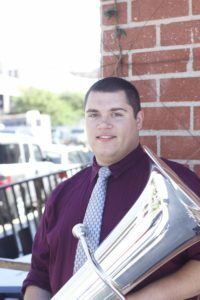 In 2015, he earned 2nd place in the Brass Division of the Pasadena Showcase House Instrumental Solo Competition, and he has been a semi-finalist and finalist in several international tuba competitions. You can hear him play tuba and bass trombone on Aaron Tindall’s solo album, This Is My House.